The Massachusetts Senate has released its comprehensive energy legislation, which will be debated next Thursday, 6/30. It includes two of Mass Power Forward's priorities, commitments for 2000 megawatts of offshore wind and doubling the rate of increase of the Renewable Portfolio Standard. The Senate legislation is a strong bill and members of the public can view the bill, S2372, at the link or in the summary here. On June 8, the House of Representatives debated and voted on a long-awaited energy bill focusing on offshore wind and hydropower. As written, the bill requires the state to procure 1200 megawatts of offshore wind energy by 2027. To our knowledge, this is the largest offshore wind bill filed in the country to date, and shows a remarkable degree of political support for the resource. With that said, wind developers and others have argued that a procurement of 2,000 megawatts is necessary to capture the full economic benefits of the state’s offshore wind industry, and a study by the University of Delaware suggests such a procurement would halve the cost of offshore wind over the next decade. The legislation also would solicit a comparable amount of hydropower (effectively one transmission line, which may also bring down land-based wind, though as drafted the language strongly favors hydropower). In the days and weeks to come, Mass Power Forward will be calling on the legislature to meet this commitment of 2000 megawatts for offshore wind and to double advances in the renewable portfolio standard to accommodate the simultaneous growth of land-based wind and other renewable resources. Mass Power Forward also is pushing for legislation to firmly prohibit the proposed "pipeline tax," which would force electric ratepayers to subsidize gas pipelines. Also of great note this week is the firm withdrawal of the previously "suspended" Kinder Morgan Northeast Energy Direct project. Senate President Stan Rosenberg made the following comment on the matter. What's at Stake in the Big Energy Bill? Read more about What's at Stake in the Big Energy Bill? 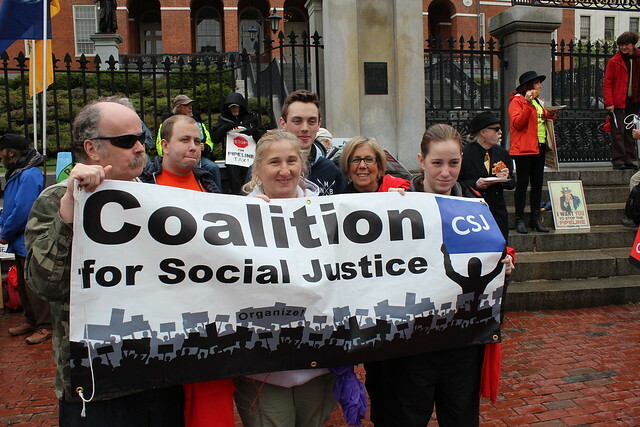 Wow––check out this great video of our May rally, including a number of activists traveling from Western Massachusetts, and great clips of testimony at the State Senate hearing. If you missed the rally, don't fret. You can read our positions on energy legislation here, as well as fact sheets on gas pipelines, offshore wind and what's needed to decommission the Pilgrim Nuclear Plant. Please contact your state legislators today to ensure our state passes a strong clean energy policy! 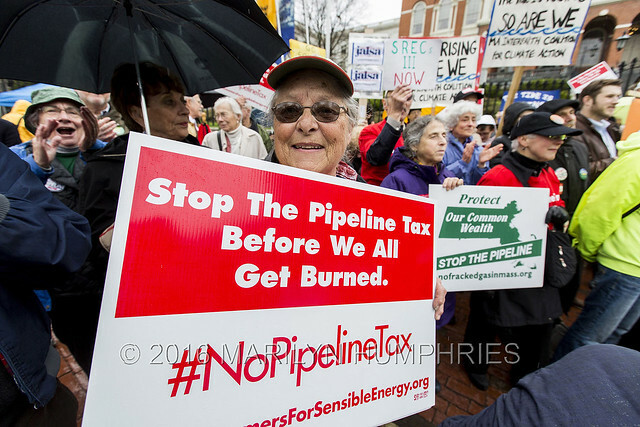 On May 3, 2016, activists from across the state converged to push back on the proposed "pipeline tax" and swarm a Senate oversight hearing on pipeline and our energy future. This event marked the first time advocates from all proposed pipeline routes gathered together to stand in solidarity and push for truly clean energy solutions. Check out some video and photos below! Photos from Marilyn Humphries, rights reserved. Mass Power Forward will be mobilizing for a number of upcoming events. Notably, the final regulatory hearing at the Department of Public Utilities for the proposed Pipeline Tax is scheduled for May 23rd. The hearing on the Spectra contracts will take place May 23, 2016 at 7:00 pm – 9:00 pm., in the Walpole High School Auditorium, 275 Common Street, Walpole, MA 02081. Please save the date and join us at the hearing.